There are many reasons to be excited about Windows Phone 7, but a bleak spot has been Microsoft's message -- or lack thereof -- on user-expandable storage, and the situation finally came to a head last week when AT&T told Samsung Focus owners to hold off on buying microSD cards altogether until Microsoft had a chance to certify some for use with the platform. How did it get to this point? Why wasn't it communicated to users that this was such a problem before the phones ever went on sale? And if it really is such a problem, why did Samsung dare to make the microSD slot user-accessible in the Focus the first place? All good questions -- and in talking with a number of sources the past few days, we've pieced together some of the answers. Read on. First off, Microsoft had never intended Windows Phone 7's storage to be expandable, swappable, or removable. Bear in mind that manufacturers occasionally use internal, non-user-accessible SD or microSD cards simply because they offer greater flexibility than soldered-on chips do -- companies merely need to swap out cards to offer different SKUs of their product with different capacities. That's exactly what Microsoft had in mind. Apparently, employees raised concerns early on that customers would be removing the cards and causing all sorts of drama in the process, and the official call was that manufacturers should glue the cards into place; somewhere along the line, that message was lost, and the Focus happened with a fully user-accessible slot. Whoops. Even so, from the phone's perspective, it's still not the end of the world if a card gets swapped. Worst case, you lose data and you need a factory reset; as far as we can tell, there's no way to end up with a paperweight. We're told that on the first boot after a reset, the phone checks the inserted card and formats it -- but that's not all that happens. One of our tipsters reminds us that the "S" in SD stands for "secure," and though most platforms don't make use of SD's security features, Windows Phone 7 most definitely does. After the format, the phone randomly generates a password that it stores in its internal Flash and then uses to secure the card, essentially bonding the card with the phone. By its design, a password-secured SD card (or microSD card in this case) can be read only with the password; otherwise, your only option is to erase it. When we removed the card from our Focus and stuck it in another phone, it couldn't be seen. It's not that we could see it but it couldn't be formatted... it simply wasn't there at all. We couldn't see it on a PC or a camera, either. Sure enough, Windows Phone 7's card security situation explains the problem -- put simply, a secured SD card attached to a machine that isn't set up to read it is very locked down, and most devices aren't equipped to decrypt or erase them. It's not a simple matter of formatting, it's a lower-level operation than that. So how does Nokia come into play here? Well, it turns out that Symbian is one of few platforms that is designed to handle a secured SD card properly -- and sure enough, we were amazed to discover that we were able to use an N8 to recover our once-dead microSD card when seemingly nothing else would. Yes, the card was erased, but in this case, that's seriously all we wanted -- we just wanted to bring the card back to life. Very strange... and very good to know. Needless to say, be sure to keep a Nokia-equipped friend close by for as long as you own your WP7 gear. But what constitutes a certified card, and why can't we get them yet? Okay, so now we know how to resuscitate cards that we're removing from Windows Phone 7 devices, but that's only half the problem; the other half is that we don't know what to replace those cards with. The official guidance at this point is that we need to wait for cards that are specifically certified for Windows Phone 7... and since those cards don't exist yet, we need to hang tight. But what constitutes a certified card, and why can't we get them yet? What we've learned from our tipsters and from documents culled from Microsoft, Samsung, and others is that the big issue is random access performance -- a figure that isn't taken into account in a card's class rating. Ironically, Microsoft discovered in its testing that cards with higher class ratings actually performed worse on Windows Phone 7 because the tweaks card manufacturers make to achieve high sequential throughput can actually hurt random access times. There's some rocket science involved here, but basically, it's a tradeoff and a bit of a gamble -- if a manufacturer tunes a card for a high class rating, it takes more time to access the first byte at a new location on the card because it's optimizing access for that area of memory, but once it does that, it can blast sequential bytes at very high speed. If you've got a lot of small reads or writes you need to make to different files at different locations in the card's memory, though, you really start to suffer. Cards with lower class ratings tend to spend less time optimizing sequential access prior to the first read / write operation, so it can move around the card (that is, access it randomly) much faster. Hold up, though -- don't run out and buy the lowest-class microSD card you can find. Hold up, though -- don't run out and buy the lowest-class microSD card you can find. We're hearing that some of the best-performing cards for Windows Phone 7 can only be bought in bulk by manufacturers at this point, which might partly explain why neither AT&T, Samsung, nor Microsoft were able to immediately step up and recommend some cards to consumers this week. 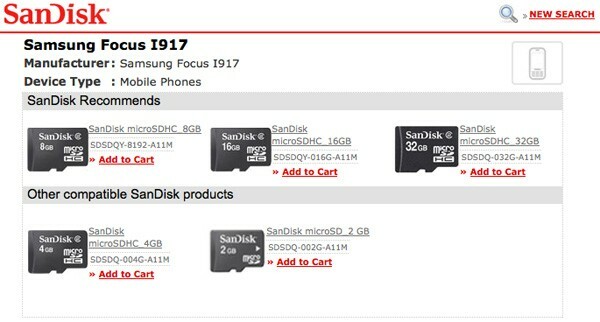 Interestingly, SanDisk -- whose memory cards are usually considered one of the gold standards for the industry -- is listing a few Focus-compatible cards on its site (see the Source link below), but it's unclear whether the recommendations are being made with Microsoft's blessing or if they're just freestyling. All in all, the situation is as clear as mud, and no one -- not AT&T, Microsoft, Samsung, SanDisk, or any other involved party -- has stepped up to definitively lay down the law, offer clearly-labeled compatible cards, and give users concise instructions for safely swapping and upgrading. We're hoping that all happens soon, but in the meantime, be careful out there -- and keep a Nokia on standby. Update: As of the afternoon of November 17th, SanDisk has pulled all of the cards from the Focus' alleged compatibility list, so it seems they were going rogue after all; we're back to square one, waiting for word from AT&T, Samsung, and Microsoft on what cards we can buy. Thanks, Steven!